In the era of big data and automation, the book presents a cutting-edge approach to how enterprises should organize and function. Striking a practical balance between theory and practice, The Intelligent Enterprise in the Era of Big Data presents the enterprise architecture that identifies the power of the emerging technology environment. 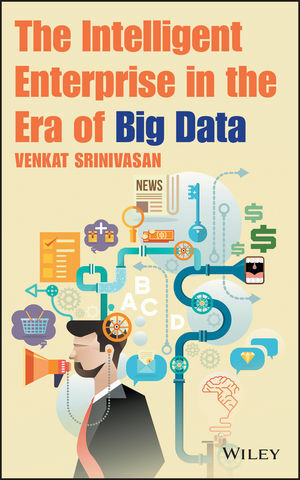 The Intelligent Enterprise in the Era of Big Data is an appropriate reference for business executives, information technology professionals, data scientists, and management consultants. The book is also an excellent supplementary textbook for upper-undergraduate and graduate-level courses in business intelligence, data mining, big data, and business process automation. Venkat Srinivasan, PhD, is Chairman and Chief Executive Officer of RAGE Frameworks, Inc., which supports the creation of intelligent business process automation solutions and cognitive intelligence solutions for global corporations. He is an entrepreneur and holds several patents in the area of knowledge-based technology architectures. He is the author of two edited volumes and over 30 peer-reviewed publications. He has served as an associate professor in the College of Business Administration at Northeastern University.